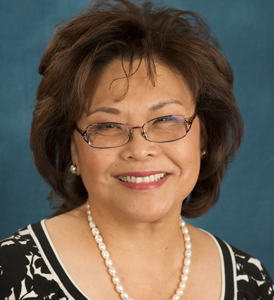 Dr. Marleen Wong, associate dean and clinical professor, serves as director of field education at the USC School of Social Work overseeing the field placements of all Master of Social Work students studying at five academic centers, including the Virtual Academic Center with students based all over the United States. Wong currently serves as co-principal investigator of the Building Capacity in Military-Connected Schools project, a $7.6 million effort funded by the Department of Defense Education Activity and a partnership between the USC School of Social Work and eight public school districts to create a more welcoming and supportive school environment for children from military families. She also serves as director and principal investigator for the USC/LAUSD/RAND/UCLA Trauma Services Adaptation Center for Resilience, Hope and Wellness in Schools, a community-based research partnership and member of the National Child Traumatic Stress Network. In 2011, she was appointed to the Substance Abuse and Mental Health Services Administration (SAMHSA) National Advisory Council. She previously served on the American Psychological Association's Presidential Task Force on Post-traumatic Stress Disorder and Trauma in Children and Adolescents. Over the past 20 years, Wong has been a frequent participant and speaker at the White House and national town hall meetings during the administrations of presidents Bill Clinton, George W. Bush and Barack Obama, including special invitations to participate in two recent White House meetings on preparing schools for emergencies after the Newtown tragedy and reducing gun violence with remarks from Vice President Joe Biden. She provided invited testimony at Gov. Dannel Malloy’s Sandy Hook Advisory Commission and consulted directly with the U.S. secretary of education to reduce violence in schools. She has also served on the expert panel of the U.S. attorney general’s Defending Childhood Initiative, as well as the U.S. surgeon general’s work group to eliminate the stigma of mental health care. Wong also has been identified as a subject matter expert in the area of at-risk populations by the Disaster Mental Health Subcommittee of the National Biodefense Science Board.